There has been a veterinary practice in Fort William since the 1940s. We are a friendly and welcoming practice, situated in new premises near to the Lochaber Leisure Centre. You can be assured that our vet and nursing staff do the very best for your animals at all times. 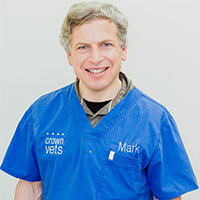 Come and see for yourself the care and dedication to you and your pets at our clinics. Our whole team is dedicated to providing first class care for all animals and their owners. We have a supportive environment for clients, and our friendly vets, nurses and receptionists are all animal owners themselves. Our practice is centrally located, only 5 minutes from Fort William town centre, where we have good parking and a spacious reception area. 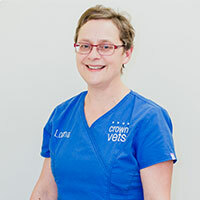 In more complex cases including specialist areas such as surgery, cardiology and skin disease, we are often able to refer clients within the Highlands to Crown Vets Referrals in Inverness. You are welcome to come and look around our practice. We have a range of medical equipment to give you the highest standards of care for your pets. We have a separate cat ward away from dogs; as well as an isolation suite, for animals with potentially infectious disease. In addition, our in-house laboratory can provide immediate test results on a range of diseases avoiding the need to send blood samples away in many cases. This means less stress for you whilst awaiting results and the best care for your pet. If you would like to arrange a visit then please give our friendly reception staff a call to book an appointment today. In addition, we value your feedback so if you are an existing client, then let us know what you think at the bottom of the page. We are dedicated to providing first class care for all animals and their owners, in a supportive environment, with a team of friendly and highly trained staff. We treat all animals as if they were our own, with love, compassion and empathy. All of our staff have animals of their own and understand what animals mean to their owners. We are committed to excellence in customer service and we pride ourselves on being able to help all animals. 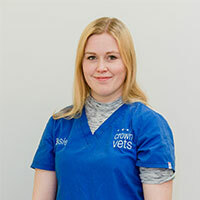 Our staff members are highly motivated and Crown Vets continually invests in staff training as well as investing in up-to-date medical equipment to ensure that your animals get the best available diagnostics and treatments. By investing in our staff, we can best help our patients and ensure that Crown Vets is a great place to work. We are very proud of what we do, and the care we give our patients and we are always keen on hearing your feedback. You can give yours by clicking the buttons below and if you use the first of the two links you could win £200 in M&S gift cards!